I first visited Full Court Press, or FCP Coffee as it is also known, the day before it opened, back in May 2013, then again two days later, when it still smelled faintly of paint. Since then I’ve been in a few times during my regular visits to Bristol. In many ways, Full Court Press is much as I first found it, with owner and head barista, Mat, still regularly changing up the coffee, bringing in exciting beans from roasters from all over the country and beyond. 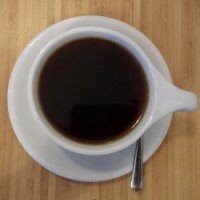 For example, during my latest visit, one of the filter coffees was a Sumatran Blue Batak from Italian speciality roaster, Gardelli, the first time I’ve had its coffee. And very fine it was. One change is behind the counter, where Will, of Didn’t You Do Well fame, has found a permanent role following Didn’t You Do Well’s sad closure. It was great to have a chance to catch up and to see him looking so well and so happy. When I first visited Full Court Press, I remember Mat showing me the basement. At the time it was just a storeroom, but I immediately saw its potential, as had Mat, who already had plans to convert it from a storeroom to an additional seating area. Fast forward two and a half years and finally I got to visit the finished article. Cool in the summer, and, I suspect, cosy in the winter, this is the perfect basement. It’s somewhere to escape from the bustle of upstairs (although I really like the bustle of upstairs). However, if you’re looking for a quiet spot to curl up with a book, then the basement is it, particularly the three comfy chairs up against the wall under the counter. Plus, who can resist going up and down the wonderful spiral staircase…? Or is that just me? While you’re down there, check out the three maps hanging on the walls. These were a gift to Mat and Full Court Press, showing Bristol as it has evolved over the centuries. In each one you can see the spire of the nearby Christ Church, allowing you to track the location of Full Court Press over the centuries relative to the growth of the city. The basement itself holds an interesting history: while the building is probably Victorian in origin, part of the redevelopment that resulting in the building of the Grand Hotel, Mat reckons it was built on top of the foundations of the original buildings that formed part of Broad Street in years gone by. The flagstone floor of the basement is built over the vaulted roof of the cellar of the previous building to occupy the spot, and who knows when that was built? So there you have it, speciality coffee, a very 21st century thing, and a spot of history. Don’t forget the original Full Court Press Coffee Spot, which includes the complete write-up and an updated gallery. You can see what fellow coffee-blogger Alison (now owner of BLK Coffee in Newcastle) made of Full Court Press and, from March, 2017, there’s this visit by Bean There At. Liked this? Then take a look at the Coffee Spot Guide to Bristol for more great coffee Spots. This entry was posted in Basements, Bristol, Cake, Coffee Shops, Coffee Spot Updates, Laptop Friendly by Brian Williams. Bookmark the permalink.